First, I recommend to read this post to understand how it works. 1. Download and add FooTable js, css and image files in the project and reference in the page. 3. This plugin works with the concepts of “breakpoints”, which are different device widths we care about. GetDataTable method returns data for gridview. You can implement it to get data from database and returns datatable or list. We define data-hide attribute to hide the column for different dimensions. 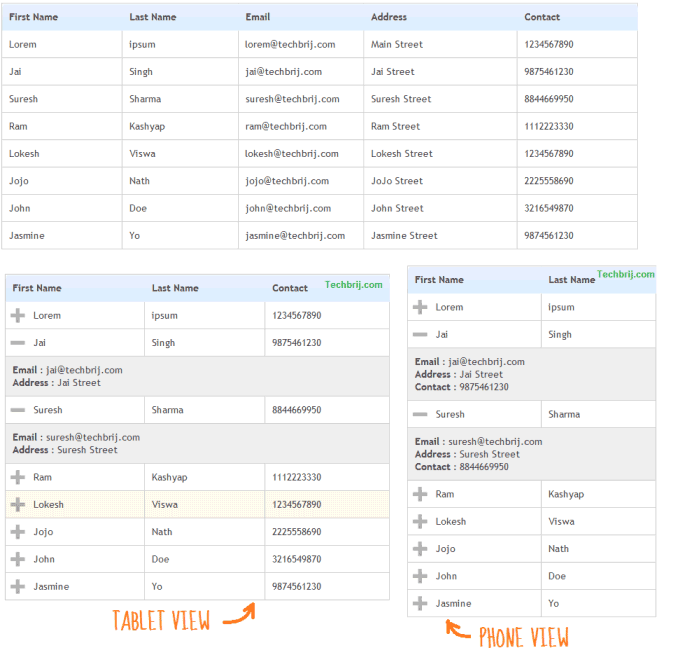 Email and Address will be hidden in tablet view and Email,Address, Contact will be hidden in phone view. On expanding, the hidden data are displayed in row by row. not work into a updatepanel, any idea? Its Not Working in Asp.net Bcoz my Page have all ready use Boostrap class !! What to Do ??? means on the desktop view it is showing tablet view i used same code as above…! when go to definition of cssclass=”footable” it show could not found css selector class footable . This is dynamic debug… anybody could help me ?? Good article. Will functions like Paging, Sorting work with this ? This is a great article, and FooTables works well for read only data. I have found that I cannot get it to properly save data in an edit mode of a GridView. Apparently the FooTable plugin “clones” the contents of the columns it hides in the collapsable area. This leaves 2 inputs with the same Id for every element in the collapsed columns. I find this making it virtually impossible to collect reliable data from the footable inputs. Has anyone else run into this? Any ideas on a workaround? Thanks for sharing. When I add CRUD to grid view,It is not work.Click edit button change back to normal grid view width.please any idea? Too Good, Helped me a lot….thanks bro…. Have you ever encountered problems with post-backs? Whenever I have to post back to the page, FooTable stops working. Has anyone solved this? how do you get it to maintain responsive layout on the gridviews in events? thanks for this, how do you get it to maintain responsive layout on the gridviews sorting event? unfortunately it doesn’t seem to work on this? Great article! To get the rounded corners, I had to wrap the gridview in a div and add the footable class to the div as well.